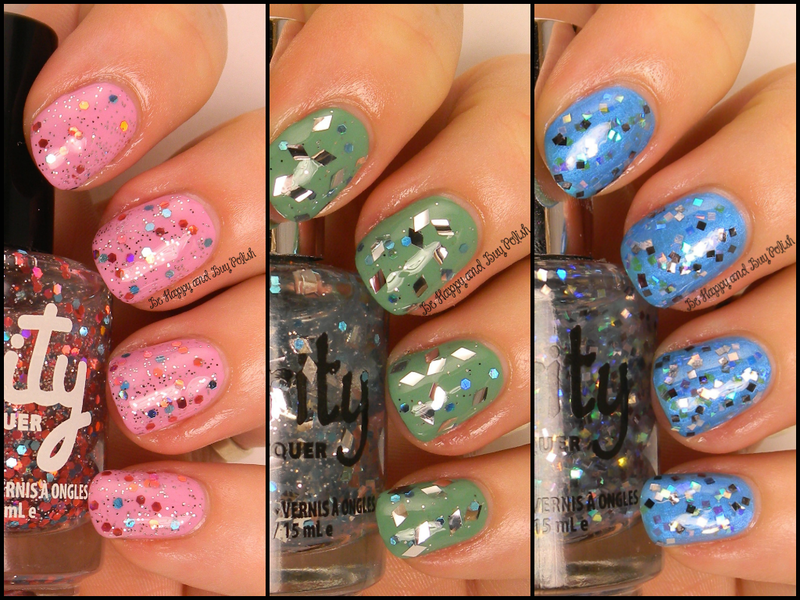 Today I have 3 glitter toppers from Verity Nail Lacquer. I’ve paired these with the nail polishes from yesterday. All are shown with 1 coat of OPI top coat. I’ve used 1 coat plus a bit of dabbing with each glitter topper. I’ll talk about formula after the swatches. Click through for all the pretties! Next is Diamond Shines, over Asian Jade. This has larger silver diamond shaped glitter, smaller blue hex glitter, and even smaller silver hex glitter. Last is Twinkle Squares over Flamenco Blue. This has square-shaped glitters that are silver and iridescent. About the formula: it seemed like each of these needed to be upside-down for over 5 minutes because the glitters had sunk. Twinkle Squares had the most plentiful glitters, while Diamond Shines had the least plentiful on the brush. Each of these can be bought through The Beauty Clutch, and you can keep up with them on Facebook and twitter for sale/restock information. I’d love to know what you think of these three glitter toppers! I can’t wait to show you my nail art tomorrow! I love the combination of shapes in the glitter: it makes it look very unique. Those are some pretty and fun glitters. I like how you paired each one of them too.